The club needs money to operate. For $30 you receive more than your money's worth. Send Bud Trapp a check made out to the order of WBW. Or bring check or cash to the January meeting. Member of AAW? If not, click here. If renewing, click here. 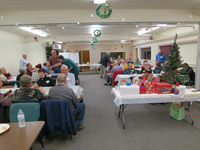 December 2015 meeting - Our Holiday Party! Dinner was served and it was good! The beautiful tree ornaments (turnings from member's lathes) were raffled. Gifts were exchanged, twenty-two in all. All were high quality turnings from member's lathes. Foremost, thanks to all the club members for their contributions during 2015. We had excellent monthly meetings and programs. The professional demonstrators were all world-class turners. I hope we see the continuation in the level of member contribution through this next year. Thanks to David Vanier for his outstanding efforts as president this past year. He has been invaluable in my transition to president. The current plan is to elect David as the Member at Large on the board. So we will continue to benefit from his contributions to the club. Little bit about myself: I grew up in the south side of Chicago. I’m a Cal Poly grad in Mechanical Engineering, and have a master’s degree from USC. I spent much of my working career in the defense industry doing system engineering and project management. I’ve been doing woodworking for close to fifty years - from making kitchens to music boxes and just about everything in between. I became interested in woodturning 5-6 years ago when I made components for a wooden clock. I’ve done some solid woodturning but my main focus is segmented turning. 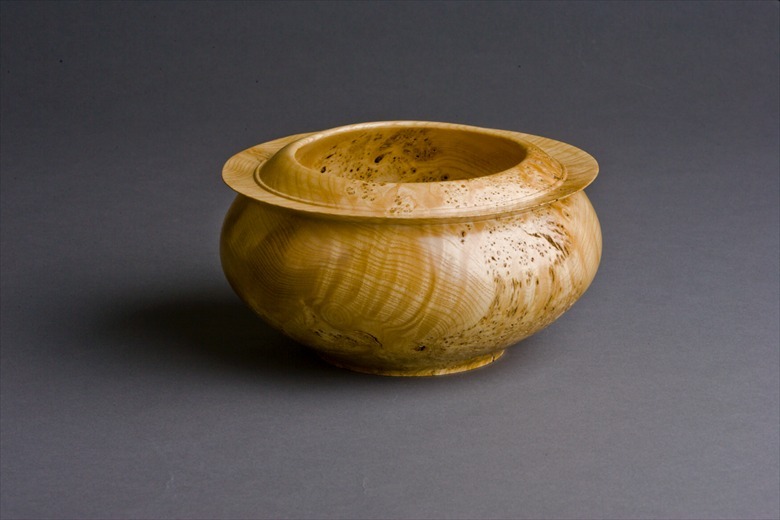 I enjoy doing a variety of types of segmented forms with my current efforts pointed toward open framed work. I’m currently on the board for the Segmented Woodturner forum, an online chapter of the AAW with about 500 members. I believe this club is very healthy - a solid membership with lots of members who pitch in and help with the club’s activities. However, we do need a few positions filled for this year. We need a Program Director. David is filling in until a new director is identified. Monthly programs and professional demonstrators are key to our successful club. Several people offered to help with programs but nobody has stepped up to the lead. If you have ideas or desires for a monthly program, please David or me know – we are always looking for new programs – particularly those that make shavings. We need a Librarian. Last year the library was reduced to only DVDs. This year the library will be kept at the church – so no more hauling the paper, tapes and DVDs back and forth. We also need a BBQ Chief. The summer’s BBQ is one of the year’s highlights. We have lots of helpers but someone needs to take the lead. I’m going to continue to have quarterly board meetings. I anticipate the meetings to be no more than an hour and half. All members are welcomed to attend. Place, time and agenda of the meetings will be announced during the monthly meeting prior to the board meeting. It is available via printable or readable PDF by clicking here and clicking on 'A Circle Cutting Jig...'. In addition, all five articles are available on the website at the bottom of 'Tutorials'.